Sometimes its the simplest ideas, that are the most genius. My husband and I charge our cell phones on our kitchen counter, and we have an ugly mess of cables that litter up the counter tops. I never would have thought of taking an old bottle and turning it into a super cute cell phone charging holder, that gets it up off the counter tops! Genius! 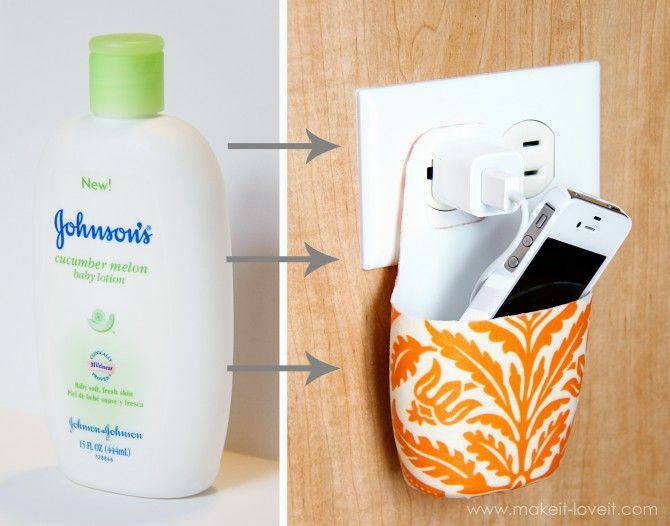 All you need is an old bottle of lotion – anything shoudl work as long as its wide and tall enough to hold your cell phone, and some charging cord. Shampoo bottles and other similar styles would work just as well. There were some mentions of safety concerns with hanging it on the plug itself, you can always put a small nail to the side of the outlet and hang on the wall instead.